Q’s girl scout troop was in charge of a fun night at her school and the girls stayed after school to decorate and set up. They ate a quick early dinner, did about 10 minutes of homework, and then each had a one-hour shift running the stations. While Q was at the “fishing” game, she told me that her CGM had alarmed and that she definitely felt low. Her CGM showed a number in the 60’s or 70’s with double arrows down, meaning that she was tanking quickly. Instead of looking for her supply bag to forage for a juice box or glucose tablets, I headed straight to the snack table where I remembered seeing a bowl of Smarties. 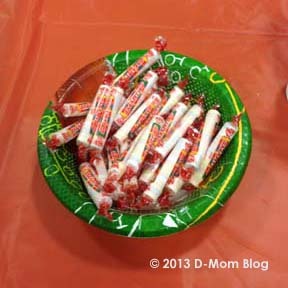 Most kids at the party were eating the Smarties as candy, but for us they are medicine.